ERBIL (Kurdistan 24) – A Turkish court in Istanbul on Tuesday sentenced the Kurdish musician and singer, Ferhat Tunc, to one year, 11 months, and 12 days of imprisonment for his social media posts supporting US-backed Syrian Kurdish forces fighting the Islamic State (IS). He disseminated propaganda for a terrorist organization, a prosecutor who was asking for up to nine years of jail argued. The trial of Tunc is the latest in thousands of cases targeting freedom of speech since a crackdown on the civil society, and Kurdish politicians began in mid-2016 under the administration of President Recep Tayyip Erdogan which emerged even more powerful in elections three months ago. Tunc’s vocal support in 2014 and onward for the besieged defenders of the Kurdish town of Kobani in Syrian Kurdistan (Rojava) during a fierce IS assault right under the border with Turkey constituted a crime according to the Turkish judiciary. His last album released in 2016 is named Kobani. With a political art career spanning three decades, he sings in Turkish and the Kurdish dialects of Kirmanjki (Zazaki) and Kurmanji. Ankara views the US-allied People’s Protection Units (YPG) in Syria a terror group on the grounds it has ties with the outlawed Kurdistan Workers’ Party (PKK). 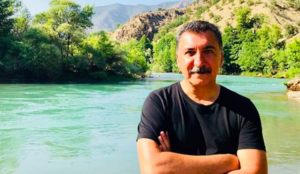 “I do not regret supporting those who battle the most barbarous organization in the world,” a defiant Tunc told the court, Kurdistan 24’s Istanbul bureau reported. “Was [the prosecutor] expecting me to remain silent in the face of IS kidnapping, enslavement and sale of women, their beheading of those not from them, and turning children into murderers? YPG defended people against an army of barbarians. I reject being accused of having mentioned the YPG and YPJ,” he added….